Prophet; lived in the reign of David. On three occasions he appears as the king's successful adviser. In connection with the building of the Temple, Nathan at first approved David's intention (II Sam. vii. 4). The same night, however, the word of Yhwh comes to the prophet saying that not David but his son shall build the Temple, but giving to David a promise of the permanency of his dynasty (ib. vii. 12-16). This vision and promise Nathan communicates to David, who accepts it without remonstrance. Again, it is Nathan who rebukes David because of the latter's sin with Bath-sheba. The rebuke takes the form of the parable of a rich man with numerous flocks who seizes a poor man's only lamb to prepare a feast for his guest. Nathan asks for judgment on his hypothetical case, and when David has condemned himself, Nathan hurls at him the stern "Thou art the man" (II Sam. xii. 1-7). The final appearance of Nathan is in connection with the recognition and anointing of Solomon as David's successor. Adonijah, the son of Haggith, sought to secure the throne by winning over the populace by means of gifts and gracious conduct and many promises. David had promised the succession to Solomon, his son by Bath-sheba. Nathan advises Bath-sheba to remonstrate with the king against the pretensions of Adonijah, promising to give timely confirmation to her words. The plan succeeds, and, by order of David, Nathan and Zadok the priest proclaim and anoint Solomon the successor to the throne (I Kings i. 5-39). In addition to these passages, Nathan is mentioned in (1) II Sam. xii. 25, as giving to Solomon the name of Jedidiah ("friend of God"); (2) Ps. li. (in the title); (3) I Chron. xvii. 2-15, which is a repetition of II Sam. vii. ; (4) I Chron. xxix. 29; and (5) II Chron. ix. 29. 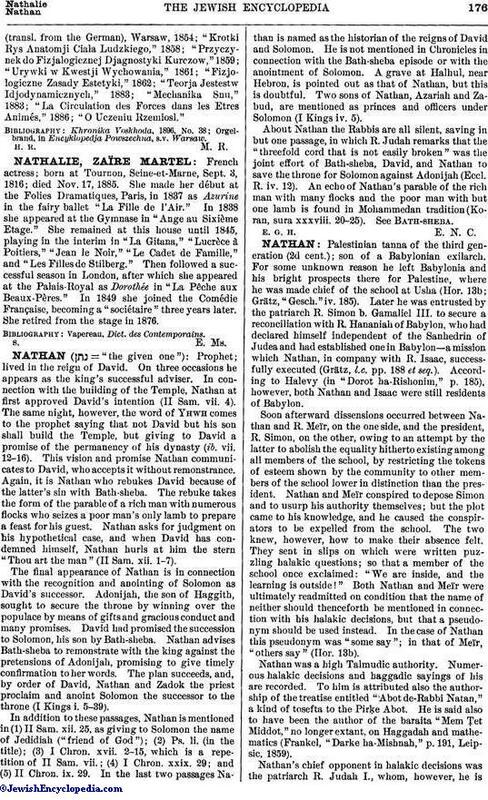 In the last two passages Nathan is named as the historian of the reigns of David and Solomon. He is not mentioned in Chronicles in connection with the Bath-sheba episode or with the anointment of Solomon. A grave at Halhul, near Hebron, is pointed out as that of Nathan, but this is doubtful. Two sons of Nathan, Azariah and Zabud, are mentioned as princes and officers under Solomon (I Kings iv. 5). About Nathan the Rabbis are all silent, saving in but one passage, in which R. Judah remarks that the "threefold cord that is not easily broken" was the joint effort of Bath-sheba, David, and Nathan to save the throne for Solomon against Adonijah (Eccl. R. iv. 12). An echo of Nathan's parable of the rich man with many flocks and the poor man with but one lamb is found in Mohammedan tradition (Koran, sura xxxviii. 20-25). See Bath-sheba. E. G. H. E. N. C.